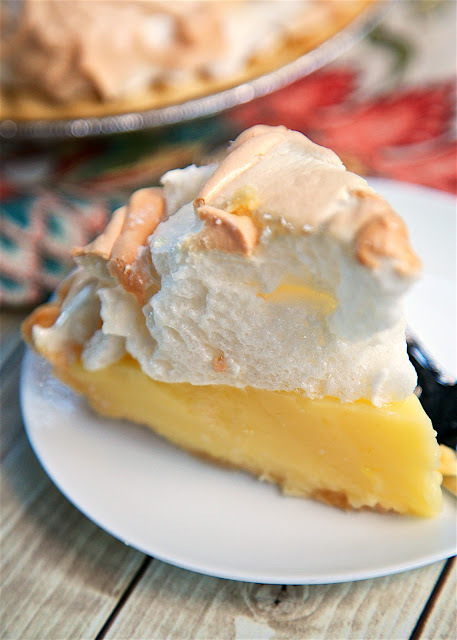 Best Ever Lemon Meringue Pie - homemade lemon pie topped with a quick homemade meringue. (sugar, cornstarch, eggs, milk lemon juice, butter, lemon zest) The pie is ready for the oven in about 10 minutes! This is seriously the BEST lemon meringue pie we've ever eaten! Great for summer cookouts! Lemon Pie is one of Chicken Legs favorites. So, when I ran across this recipe in one of my cookbooks and had to give it a try. 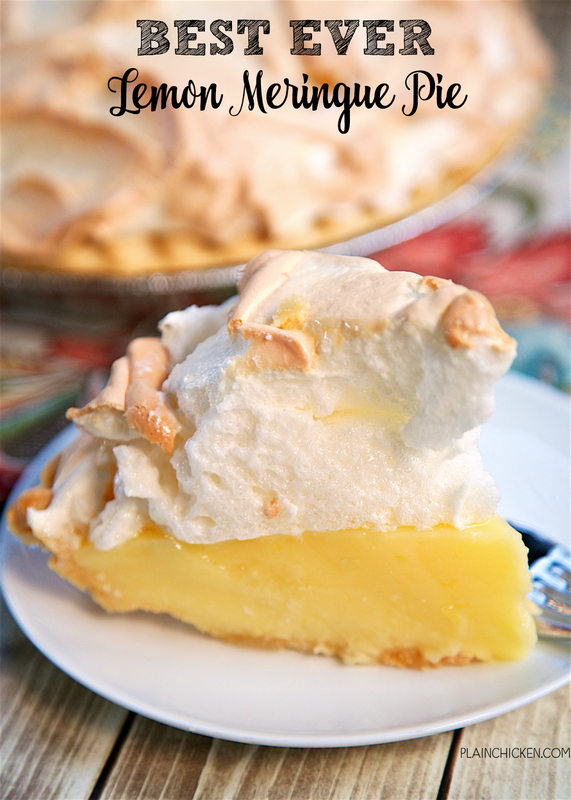 With a name like "Best Ever Lemon Meringue Pie" how could I not?!? This pie uses a traditional pie crust. I used a frozen pie shell and it worked great. 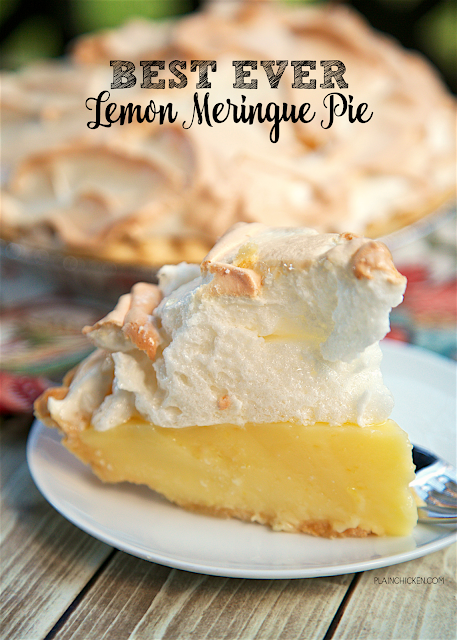 The filling is delicious, but the meringue puts this pie over the top! SO good! The hardest part about making this pie is waiting on it chill! Pure torture! So, the verdict? Is this the Best Ever Lemon Meringue Pie? We think it is! We both couldn't stop eating this! SO yummy! Give this a try for Mother's Day dessert! You can make this a day in advance an keep it refrigerated until you are ready to serve. I promise Mom will thank you! In a medium saucepan, whisk together sugar, cornstarch, salt, egg yolks, milk and lemon juice. Bring to a boil over medium heat, continue whisking constantly for 1 minute. Remove from heat. Whisk in butter and lemon zest. Pour into cooked pie crust. In the bowl of an electric mixer fitted with the whisk attachment, beat egg whites and cream of tartar until foamy. Gradually add sugar, 1 tablespoon at a time, beating util stiff peaks form (about 4 minutes). Add vanilla, beat well. Spread meringue over pie filling. Bake for 20 to 25 minutes, until meringue is lightly browned. Remove from oven and cool on wire rack for an hour. Refrigerate until ready to serve. The recipe is below the second picture and above your comment. My meringue didn't get gross or weepy one day after making it. I love lemon pie. And that meringue. I am jealous of that meringue! Looks absolutely wonderful! Thanks for sharing the recipe. Looks wonderful! Other recipes I've seen use water where yours uses milk. How does the milk change the final product? Thank you. Not sure. I’ve never used water in lemon pie filling.